ToursByLocals Blog - Who Were 2016's Busiest Guides? Who Were 2016's Busiest Guides? At the end of each year, we compile a lot of interesting numbers: how many travelers toured with our guides? (We hit the half-million mark back in October!) Which tours were the most popular? Where are most people traveling? How have these numbers changed from last year? The question we wanted answered today was: which of our 1872 guides were the busiest in 2016? Below, we’re going to share the names of the 10 guides who booked the most tours this year; if you’re thinking of booking a tour with one of them in 2017, we’d advise you to do it soon, as their spring and summer calendars are already filling up quickly! Before becoming a private guide, Pepe’s career saw him working internationally in Michelin-starred restaurants. If you love to immerse yourself in the local scene, and also enjoy discovering good food and wine, Pepe is the right guide for you. He can deliver both a sparkling tour of the city’s highlights, or a more intimate look at the daily life of Madrileños. Or a blend of the two! The choice is yours. Barcelona has become increasingly popular in the last five years, and our guide Francisco, with his deep knowledge of Gaudi, is an excellent person to help you understand why. As a professional photographer, Francisco will take photos of your day (and can give you tips to take better ones); he’ll send them to you once you’ve returned home from vacation. This is the second year in a row that Francisco has been at #3 on our list! Melinda epitomizes the curiosity and love for knowledge that the best guides share. As she writes in her profile: “To me every corner tells a story about the past and every street leads somewhere worth exploring.” Her tours around Budapest can take you from local delicatessens to trendy Ruin Bars, while exploring the history and culture on both sides of the Danube. We love Caron’s energy, charm and vivacity. An expat from the United States, she’s made her home in Italy for the past 12 years, where she lives and guides with her husband Mauro. 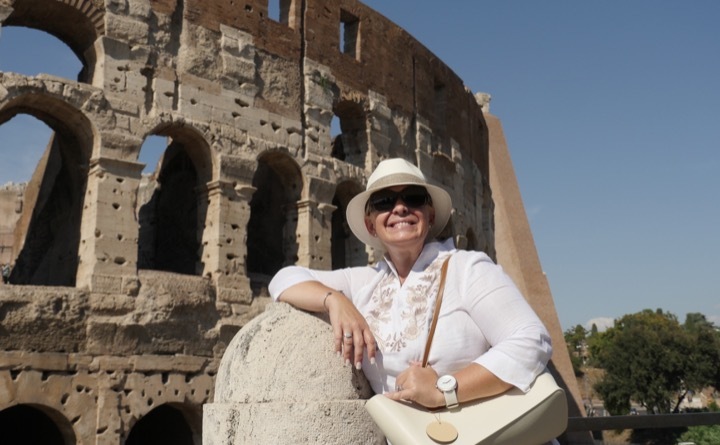 See Rome and the surrounding Italian towns and countryside with Caron and you can be assured you won’t miss a thing! Her desire to share Italy’s culture with travellers means at the end of a day with her you’ll have unforgettable stories to share back home. Maintaining a place in the Top 10 for the third year running is Tomislav from Croatia! His hometown of Dubrovnik was the location used in the hit TV series Game of Thrones, and Tom’s runaway success is partly driven by the wonderful tours he’s created for fans of the show. But he’s not a one-trick pony. The other part of his appeal comes from his engaging personality and superb knowledge of all things Dubrovnik. Tom is about to become a father! We wish him all the best with the new joys and challenges to come in 2017. Sandra’s travelers rave about how she “brings the city’s art and history to life.” And as a licensed guide in Barcelona, Sandra can not only take you on an in depth tour inside any museum: when you’re with her, you can skip the line! She’s been a guide with us since 2010, and we’re so happy to see her break the Top 10 for the second time! Dino has given a total of 601 tours of his beloved city of Rome to ToursByLocals travellers since he became a guide with us in 2012. Dino has a PhD in Roman History, but his “lectures” around the city include gelato, Italian wine and his lively sense of humour. Dino wants his travelers to fall in love with Rome, just as he did many years ago. You can’t go wrong exploring the city with this guy. David was our busiest guide in Paris this year (typically, the most popular destination for ToursByLocals travelers, but visitor numbers dropped after the attacks on Paris and Nice.) Travelers love how David imparts local knowledge along with history, and the way he helps Paris come alive for them. He’s done everything from macaron-themed tours to organizing marriage proposals at the Eiffel Tower. David hopes (along with our other Parisian guides) that travellers return to his beautiful city in greater numbers in 2017. An honourable mention goes out to Caesar in San Francisco, who was only one tour short of tying for 10th place! This is the highest a North American guide has ever been on the list, so congratulations to Caesar for a fantastic year. Congratulations to these guides for all the work they’ve done with ToursByLocals in the past year (and years previous!) We’ve only listed here the ten guides who booked the most tours, and we’re compelled to add that they represent just a small handful of the wonderful, dedicated, and deeply knowledgeable people on our site.